Members of the Security Council vote after presentations for a resolution for an independent investigation on the use of chemical weapons in Syria during a Security Council meeting, April 10, 2018, at United Nations headquarters. The Security Council also rejected another Russian-drafted resolution that would have welcomed an investigation by the Organization for the Prohibition of Chemical Weapons of allegations of a weekend chemical attack in the suburbs of Syria's capital. The U.S., Britain and France opposed the measure, saying that the investigators are already headed there and that the text didn't include a new way to assess blame for chemical attacks. The council has met four times in the past week on chemical weapons in Syria, with the U.S., Britain and France facing off against Russia, Syrian President Bashar Assad's key ally that insists no chemical attack took place in the Douma suburb. As tensions escalate over possible U.S.-led military reprisals for the suspected attack, the U.N.'s most powerful body remained paralyzed, unable to overcome its deep divisions that have shown during the seven years of conflict in Syria. Sweden's ambassador, Olof Skoog, who tried unsuccessfully to find a compromise solution, told the council after the third vote that he was disappointed. After the defeat of Russia's second resolution, Russian Ambassador Vassily Nebenzia said to U.S. Ambassador Nikki Haley: "I would once again ask you, once again beseech you, to refrain from the plans that you're currently developing for Syria." United States Ambassador to the United Nations Nikki Haley speaks during a Security Council meeting, April 10, 2018, at United Nations headquarters. The threats of U.S. military action against Syria "should make us seriously worried, all of us,'' Nebenzia said. In Tuesday's first vote, Russia vetoed a U.S.-drafted resolution that would have condemned the suspected Douma attack in the strongest terms and established a new independent and impartial investigative body to determine responsibility for Syrian chemical attacks. 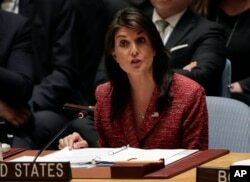 "History will record that, on this day, Russia chose protecting a monster over the lives of the Syrian people," Haley said, referring to Syrian President Bashar Assad. She said the United States "went the extra mile" to get Russian support for the resolution to ensure that a new investigative body would be impartial, independent and professional — provisions she said were not in the rival Russian resolution. Haley said the Russian draft would have allowed Russia to choose the investigators and assess the outcome of the investigation. "Does any of that sound independent or impartial?" He said the U.S. and its allies didn't need a resolution to determine responsibility because it was already blaming Syria and Russia. "You do not want to hear the fact that no traces of a chemical attack were found in Douma,'' Nebenzia said. "You simply have been looking for a pretext'' and want the resolution to fail "to justify the use of force against Syria." The rival Russian resolutions — on a new accountability body and the OPCW fact-finding mission — both failed to get the required nine "yes" votes needed for adoption. The U.S., Britain and France voted against both measures but didn't have to use their vetoes. Nebenzia and Syrian Ambassador Bashar Ja'afari said that despite the council's failure to welcome the OPCW fact-finding mission, its investigators are heading to Syria with support from both Russia and Syria.